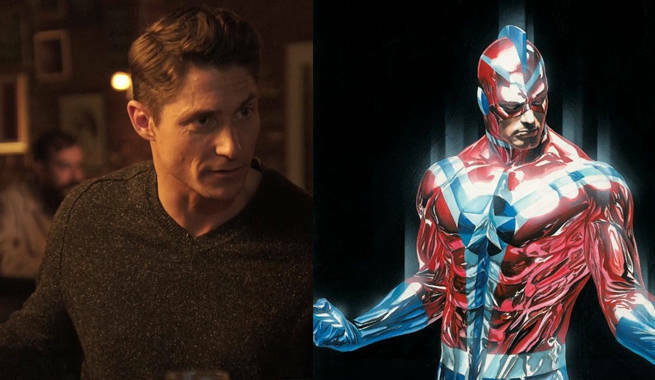 Legends of Tomorrow has cast its next member of the Justice Society of America, as Commander Steel joins the crew. Matthew MacCaull, who played the villainous Sebastian on iZombie on The CW moves over to DC Comics proper for the role, EW reports. If you feel like you've already read this announcement, that's because Commander Steel's grandson, Citizen Steel was also recently cast on the show with Nick Zano in the role. Commander is Henry Heywood, Sr. and Citizen is Dr. Nate Heywood. The time travel aspect of the series will likely explain how they're both young with superheroic identities simultaneously, and should make for a fun moment or two when the pair meet and are nearly the same age. MacCaull as Commander Steel joins Maisie Richardson-Sellers as Vixen, Patrick J. Adams as Hourman, and the yet-to-be-cast Obsidian, Stargirl, and Dr. Mid-Nite in the JSA on the show. The team logo was just revealed earlier this week. Legends of Tomorrow returns to The CW for season two on Thursday, October 13, 2016. The series, one of four DC Comics shows on the network, will feature several returning cast members and several new ones after the time traveling antics of the team in the first season may have caused more problems than it solved. In addition to the new superheroes of the Justice Society of America, they'll also be introducing the villain team of the Legion of Doom.